This article was originally published by Open Democracy on 17 July, 2015. The humanitarian crisis being inflicted on the people of Yemen is only getting worse. Over 2000 people have died in the Saudi-led bombardment that, according to the World Health Organisation, has left over one million people displaced. The long term consequences are likely to be no better; the UN has warned that over 20 million civilians are in need of urgent assistance. The situation has been exacerbated by a Saudi imposed blockade that is stopping food and other basic essentials from reaching those in need. Last year’s attacks on Gaza killed over 2200 people and wiped out much of its infrastructure. 18000 homes were seriously damaged or destoyed, schools and hospitals were bombed and whole communities have been left without regular electricity. It may be one year on, but the reconstruction has barely begun. One report from the Association of International Development Agencies found that only a quarter of the $3.5 billion of pledged aid has actually been delivered. In 2012 a UN report concluded that unless there was serious action then Gaza may no longer be ‘liveable’ by 2020. Those warnings remain every bit as pertinent today. Both situations are intolerable, and in both cases it is civilians who are paying the price. Both situations have been condemned by the international community, and yet both have been fuelled by arms and political support from Western powers. We are forever being told of the ‘rigorousness’ and ‘robustness’ of UK arms export controls, but the reality is that nothing could be further from the truth. The problem is less to do with legislation and more to do with a lack of political will. In theory UK arms exports are supposed to work on the basis of a risk assessment. This means that arms should never be licensed if there is a ‘clear risk‘ of them being used in violation of international humanitarian law or for internal repression. By any reasonable interpretation this should block all arms sales to Israel and Saudi Arabia. The Saudi regime is one of the most oppressive in the world, and Israel’s treatment of people in the occupied territories has been both immoral and illegal. Both states have regularly been accused of flouting international law and both have a history of aggression towards their neighbours. At the same time, both have enjoyed close political and military relationships with the UK. 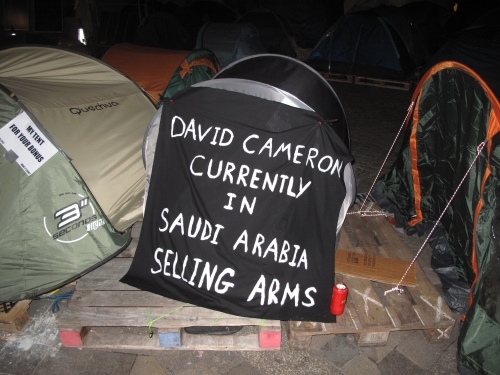 Saudi Arabia is the largest buyer of UK weapons, and has been for a number of years. Saudi forces have used UK weapons in Bahrain and are using UK aircraft against the people of Yemen. Unfortunately this isn’t even the first time UK aircraft have been used against Yemen. Research from Amnesty International shows that UK weapons were very likely to have been used by Saudi Arabia in the 2009 bombing too. Last August a report from the Department of Business, Innovation and Skills (BIS) found that the UK had approved 12 export licences to Israel for weapons that may have been used in attacks on Gaza. In response, the then Business Secretary, Vince Cable, concluded that the licences should be suspended, but only with the unacceptable caveat that this should only be in the event of any ‘resumption of significant hostilities.’ In effect, the government’s policy was that even more people would need to die before anything could be done. Furthermore, Arming Apartheid: UK Complicity in Israel’s Crimes Against the Palestinian People, a new report published by Campaign Against Arms Trade, War on Want and the Palestine Solidarity Campaign, shows that the UK government approved over £4 million worth of military export licences in the four months immediately following last summer’s assault. What these examples have in common is that they are representative of an arms control policy that is broken. They are the inevitable result of a policy that focuses on maximising arms sales rather than limiting them. This is because the government is not merely a dispassionate observer in the arms trade, it is an active participant. There is even a government department, UK Trade & Investment’s Defence & Security Organisation (UKTI DSO), that exists solely to promote the sale of weapons abroad. This year the 130 strong body will be key to the organisation of DSEI, the world’s biggest arms fair, which will be rolling into East London this September. Among attendees will be some of the biggest arms companies in the world and many of the most oppressive dictatorships. How can the government credibly claim to be fighting for human rights and democracy when it is actively courting and arming tyrants? UK weapons haven’t just being used against Yemen and Gaza, in recent years they have also been linked to abuses in Bahrain, Egypt, Hong Kong and Kuwait. These are only the examples we know about, and the only reason we know about any of them is because of the brave work of activists and journalists in uncovering them. None have been brought to light by the government off its own accord and nor have they resulted in changes to legislation. When countries like the UK sell weapons it not only facilitates the attacks they are used in, it also sends a message of support to the governments that are carrying them out. For this to change it will require more than the cancellation of a few licences, it will need a complete overhaul of government priorities and an end to the hypocrisy that is at the heart of foreign policy. Andrew Smith is a spokesperson for Campaign Against Arms Trade and tweets @CAATuk.